The Windfree Energy Initiative is an outstanding example of how public-private partnerships can work together to inspire our youth and make our city a better place to live, work and raise families. I commend Doug Snower and Charles Shenk of Windfree, Sharon and Peter Exley of Architecture Is Fun, and Principal Vinita Scott for their leadership and commitment to education. ~ Mayor Richard M. Daley, Mayor of Chicago. Architecture Is Fun and our colleagues at Windfree Wind & Solar Energy Design have developed a wide range of products to help students explore the science of wind power through hands-on activities that focus on physics, meteorology, engineering and design innovation. We are committed to innovative energy education, promoting the beauty on alternate sources of energy that can challenge and inspire students. 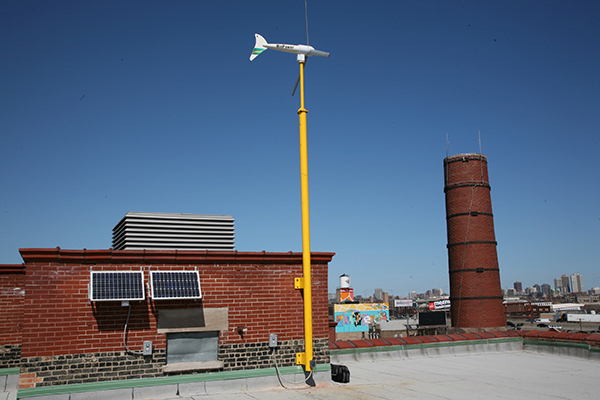 Through a grant process, the Jonathan Burr Elementary School received a gift of a wind turbine and photovolatic panels on their school roof. These renewable energy technologies were linked to a battery system and the Grow Project that powers up student learning. 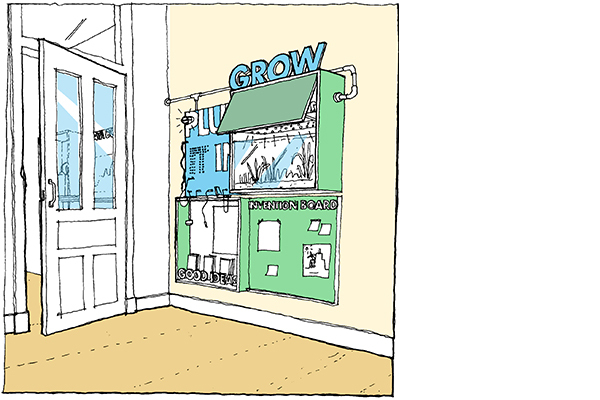 The Grow Project is a series of classroom or museum components directly fueled by energy generated from wind turbines and photovoltaic panels; all of which help children understand their responsibility and how to make sustainable choices to improve everyday energy usage. * The Interactive Student Panel can charge up handheld electronics, monitor the energy system, or create building wind farm models. 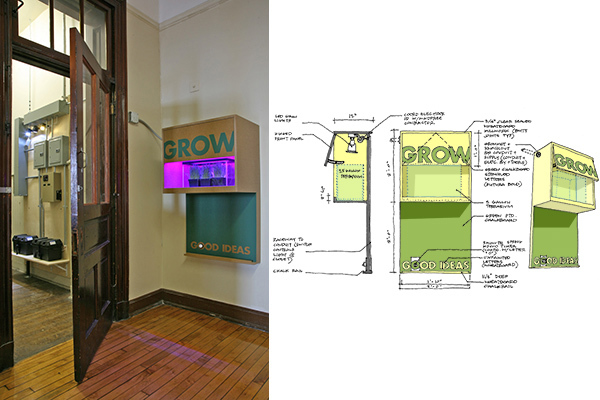 * The Grow Box aka Alt. Greenhouse is a garden of green ideas where small pumps irrigate and incubate plants growing under LED lights and nighttime heaters warm fragile seedlings. Students can monitor the daily energy generated as they plant, design pots with drainage systems, observe temperate conditions and conduit irrigation experiments. 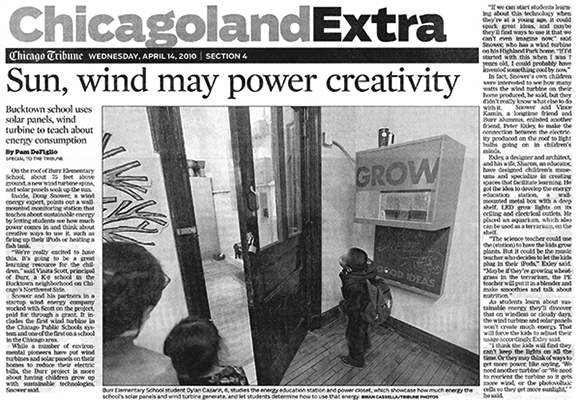 * The Why Wind Cart is powered up at night for classroom or outdoor environmental education, with laptop plug-in capabilities, children view the rooftop energy gardens via webcams or power up fans for physical science experimentation. * The Invention Board, tack, dry-erase or chalk, is a place to post those creative thoughts and inventive ideas. * The Box of Good Ideas features an easy-to-comprhend diagram of the school’s energy system as well as other good ideas of how to take responsible action in decreasing energy use and caring for the environment through recycling, reuse, and re-imagining. 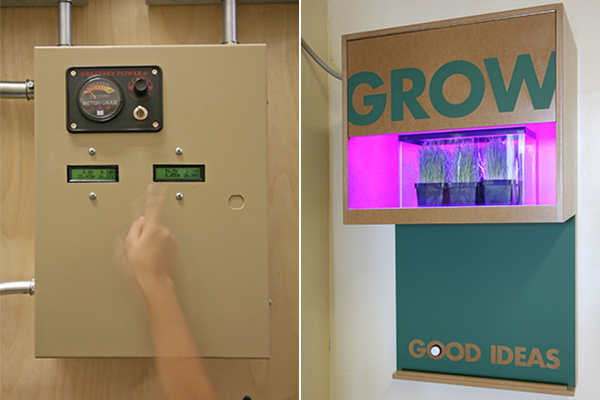 Our Grow Projects are helping educate the next generation of energy consumers and decision-makers. Architecture, Exhibit Design & Educational Programming: Architecture Is Fun, Inc. Rendering: © Architecture Is Fun, Inc.
© 2019 Architecture Is Fun All Rights Reserved.